They say with age comes wisdom. I fear I am the exception to that rule. What doesn’t come with age is knowledge. I proved this by spending the first 20 years from my Crohn’s diagnosis knowing very little about the condition. You could sum it up as : nobody knows what causes it; it’s incurable; you take steroids to keep it under control and get on with life; not many people have heard of it. In 1998 there was the first mention of possible surgery to remove a stricture. I now needed to know what “stricture” meant and its implications. I started to take a little more interest but once I was safely weaned onto an immunosuppressant, and back to some sort of equilibrium, then my interest waned and life quickly returned to “normal”. Another decade passed and then a routine blood test showed my platelets were dropping. As this was a known side effect of the immunosuppressants they were stopped. In May 2009 a CT scan painted a complicated picture of both ileal disease and the suspicion that I was fistulating into other parts of the small bowel, possibly the sigmoid. My consultant put it in simple terms: “It looks like you’ve got an octopus in there”. Fistula? I had no idea what that meant. It certainly sounded somewhat unsavoury. I started, again, to resign myself to surgery. After a brief, expensive, unsuccessful flirtation with Infliximab, the knife became inevitable. As it approached I was confronted with new medical terms and there would be new skills to learn, for instance changing a stoma bag, but the knowledge I sought was still confined to my immediate needs. Some of the basic information, that I’m assuming (hoping) newly Dx’d patients nowadays take for granted, had sadly passed me by. It wasn’t until 2012 that this was remedied by a couple of things, the first being my increased awareness of SoMe which lead to reading other patient’s stories. The second started a little more dramatically. In mid-2012 I was rushed into our local hospital leaking upper GI blood. Once stabilised, given my history of Crohn’s, I was placed on the gastro ward. It was an eye opener. There were patients there who had admitted themselves as they were having a flare-up! Really? That was new to me. I had never even considered doing that. Could things really get that bad? I became reacquainted with my old IBD Nurse who, sadly, had returned to being “just” a ward sister as she wanted to reclaim her private life. One quiet afternoon she sat on the end of my bed and we started chatting about Crohn’s disease. She was surprised at my lack of knowledge and quickly realised that nobody had ever talked me through the basics. It was assumed that someone who had experienced the condition for so long must know all about it by now. I was guilty of this assumption myself as I knew no better. Our conversation was a wake up call to become better informed. Now my curiosity was awakened. Six years on my curiosity is stronger than ever but I’ve hit a bit of a brick wall. It’s been the subject of previous posts and many, probably too many, Tweets. Although I’ve been in remission for several years I still undergo regular monitoring and this is where the problem lies. 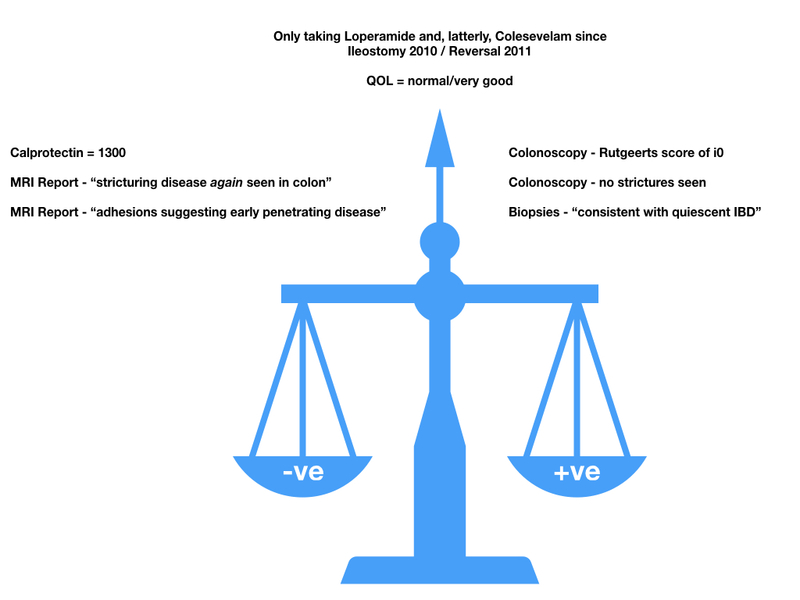 As usual I’ve drawn a diagram that represents my take on the situation.. My case has been discussed at the Multi Disciplinary Meeting of one of the country’s leading gastro teams and the conclusions were : the colonoscopy findings outweigh the MRI findings in the colon. The small bowel was reassuringly uninflamed. There is no explanation for the raised calprotectin in terms of Crohn’s disease. Watch and wait. From a health point of view I’m happy to “watch and wait” but my curiosity is sufficiently piqued that I would like find a logical explanation. It’s difficult to know what to do next. I’m rather hoping that by putting the details of my case out into the big world of SoMe it might just strike a chord with somebody – a fellow patient, an HCP or even a testing lab – and they will be able to point me towards a solution. Until then I have a feeling I will be returning to this subject on a regular basis.